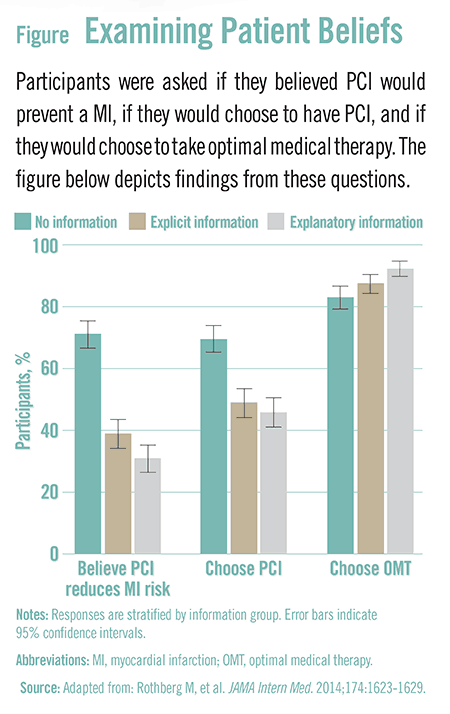 In JAMA Internal Medicine, Dr. Rothberg and colleagues had a study published that explored how the presentation of potential benefits and risks of PCI and OMT influences patients’ beliefs and decision making. Specifically, the analysis looked at the effect of information presentation on beliefs about PCI and willingness to choose it. In an online survey, more than 1,200 adults aged 50 and older were asked to imagine having experienced chest pain and being referred to a cardiologist. They were then randomized to one of three scenarios. In the first, patients received no information about the effects of PCI on MI. In the second, participants were told specifically that PCI will not reduce the risk for MI. In the third, patients were told why PCI does not reduce the risk for MI. Then they answered questions about the procedure and whether they would choose it. Presenting factual information affected participants’ beliefs and decisions regarding PCI (Figure). “Over 70% of participants who received no information about whether PCI would prevent MI believed that the procedure would do so,” says Dr. Rothberg. “Simply stating that PCI would not prevent an MI reduced this percentage to 39%, and explaining why PCI would not prevent MI was even more effective.” These findings suggest that physicians should explicitly state that PCI will not prevent MI because patients may otherwise assume that it will. The research team also asked participants to recall what their physician said about the benefits of PCI. Only one in five patients receiving no information could correctly recall that the physician said nothing. However, about two-thirds of patients who received explicit or explanatory information remembered the physician saying there would be no reduction in risk of MI. In addition, more than half of patients in the group with no information falsely remembered that their physician had told them that PCI would reduce their risk for an MI. Rates were much lower for patients in the other groups. Furthermore, about one-fifth of patients still believed that PCI would prevent an MI despite remembering the physician saying it would not. These findings illustrate that deeply ingrained patient beliefs may have an important impact. Several strategies have been proposed to improve patient understanding when deciding on PCI, including a standardized consent template and decision aids. These interventions are still being tested but may be helpful in the future. In addition, several factors may be at play. For example, not all patients’ misconceptions can be overcome easily. Cardiologists may also mistakenly believe they are successfully communicating with patients. Self-assessments of how these messages are being delivered could become an important quality improvement initiative in the future. Dr. Rothberg points out that another important misconception is patients can choose between OMT and PCI to reduce their risk of MI. “OMT is recommended regardless of whether or not a patient receives a stent,” he says. “Communicating the benefits of PCI remains challenging for clinicians but is essential to fostering informed-decision making. Providing even small amounts of information to patients has the potential to affect their beliefs and decisions.” The study notes that this can be accomplished without requiring patients to watch lengthy videos or having physicians spend too much time with patients. In light of the findings, Dr. Rothberg recommends studies be undertaken to assess the effects of brief interventions on patient misconceptions regarding the benefits of elective PCI. Rothberg MB, Scherer L, Kashef MA, et al. The effect of information presentation on beliefs about the benefits of elective percutaneous coronary intervention. JAMA Intern Med. 2014;174:1623-1629. Available at: http://archinte.jamanetwork.com/article.aspx?articleid=1898876. Rothberg MB, Sivalingam SK, Ashraf J, et al. Patients’ and cardiologists’ perceptions of the benefits of percutaneous coronary intervention for stable coronary disease. Ann Intern Med. 2010;153:307-313. Coylewright M, Shepel K, Leblanc A, et al. Shared decision making in patients with stable coronary artery disease: PCI choice. PLoS One. 2012;7:e49827. Oshima Lee E, Emanuel EJ. Shared decision making to improve care and reduce costs. N Engl J Med. 2013;368:6-8. Stergiopoulos K, Boden WE, Hartigan P, et al. Percutaneous coronary intervention outcomes in patients with stable obstructive coronary artery disease and myocardial ischemia: a collaborative meta-analysis of contemporary randomized clinical trials. JAMA Intern Med. 2014;174:232-240. Michael B. Rothberg, MD, MPH, has indicated to Physician’s Weekly that he has received grants/research aid from the AHRQ, the National Heart, Lung, and Blood Institute, and the Informed Medical Decisions Foundation. 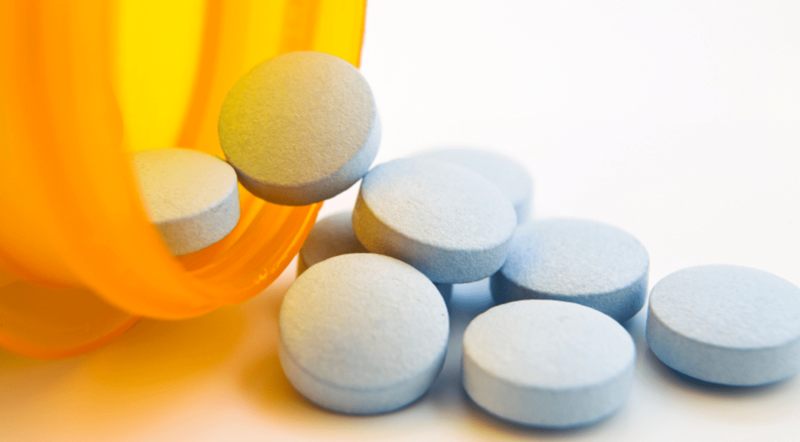 The Opioid Epidemic: What Was the Joint Commission’s Role?